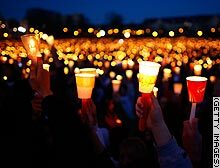 Today, we remember those that lost their lives at VA Tech in Blacksburg, VA and pray for their family and friends that they may find peace in such a tragic and horrible event. Please say a prayer. It is hard to believe that it was only one year ago when the worst shooting massacre in US history took place at VA Tech. 32 people were senselessly killed during Seung-Hui Cho’s rampage. It is always tragic when one passes. It is made even more sad when those that die are so young and full of promise. It is made even more profoundly unimaginable when 32 are taken at once due to a mad man with mental issues. However, this is not about the killer … this is about those that perished, remembering and honoring them, and their family and friends. It is obvious that the pain still exists for families at their loss. There are some times no words of comfort that we can provide. We can only let them know that we are thinking an praying for them. Today, we all become VA Tech alumni and pray for Hokie nation. The darkness was broken by the flickering of a white candle, lit at the stroke of midnight. Soft weeping and the solemn strains of “Taps” were all that broke the silence of more than a thousand people gathered around the 32 memorial stones honoring the dead. 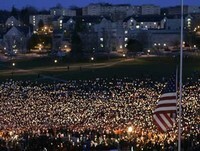 to let the healing begin at Virginia Tech. S’not about guns, S’bout random lunatics. Plenty of Gunophobes are now screaming that guns must be registered (read confiscated). Minutes after this psycho committed the mass murders, the anti-gunners were changing the subject to suit their agenda. This miscreant coward shot himself to avoid the aftermath of his crimes. Let’s remember in all of the media analysis just who is to blame for this heinous crime that has shocked the sensibilities of all rational people. The videos show that this was a plane and premeditated event. Who is to blame? Ultimately it is the shooter, , Cho Seung-Hui. This man was so filled with hate there may have been no way to have stopped this massacre. He was hell bent on going out with a blaze of glory. As we all sit back and absorb the horror of yesterday’s shootings at VA Tech, let us remember those that lost their lives. Let us say a prayer for their families as their grieving must be beyond imagination. So many young lives lost. 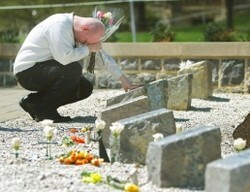 As many of our Nation’s Colleges Mourn Va. Tech Victims let us never forget those that were lost. Say a prayer for their families and loved ones and may they find peace in God’s grace. Quoting Scripture, he told those angered by the killings not to be overcome by evil. Please let us remember those that passed away during yesterdays shooting. May they rest in peace and God bless. The magnitude of the violence and profound loss changed these students and faculty from VA Tech Hokies to one of a nations. The University has set up a web site for condolences, The April 16th Memorial website. Please leave your comments, prayers and condolences. One can only imagine the grief that they Hokie community is going through and the words of comfort they so much are in need of. Ross Abdallah Alameddine, 20, of Saugus, Mass., according to his mother, Lynnette Alameddine. Christopher James Bishop, 35, according to Darmstadt University of Technology in Germany, where he helped run an exchange program. Ryan Clark, 22, of Martinez, Ga., biology and English major, according to Columbia County Coroner Vernon Collins. Austin Cloyd, an international studies major from Blacksburg, Va., according to Terry Harter, senior pastor at First United Methodist Church in Champaign, Ill., where Cloyd and her family lived before moving to Blacksburg. Jocelyne Couture-Nowak, a French instructor, according to her husband, Jerzy Nowak, the head of the horticulture department at Virginia Tech. Daniel Perez Cueva, 21, killed in his French class, according to his mother, Betty Cueva, of Peru. Kevin Granata, age unknown, engineering science and mechanics professor, according to Ishwar K. Puri, the head of the engineering science and mechanics department. Caitlin Hammaren, 19, of Westtown, N.Y., a sophomore majoring in international studies and French, according to Minisink Valley, N.Y., school officials who spoke with Hammaren’s family. Jeremy Herbstritt, 27, of Bellefonte, Pa., according to Penn State University, his alma mater and his father’s employer. Rachael Hill, 18, of Glen Allen, Va., according to her father, Guy Hill. Emily Jane Hilscher, a 19-year-old freshman from Woodville, according to Rappahannock County Administrator John W. McCarthy, a family friend. Jarrett L. Lane, according to Riffe’s Funeral Service Inc. in Narrows, Va.
Matthew J. La Porte, 20, a freshman from Dumont, N.J., according to Dumont Police Chief Brian Venezio. Liviu Librescu, 76, engineering science and mathematics lecturer, according to Puri. G.V. Loganathan, 51, civil and environmental engineering professor, according to his brother G.V. Palanivel. Partahi Lombantoruan, 34, of India, civil engineering doctoral student, according to Kristiarto Legowo, a spokesman for the foreign ministry. Lauren McCain, 20, of Hampton, Va., international studies major, according to a statement from the family. Daniel O’Neil, 22, of Rhode Island, according to close friend Steve Craveiro and according to Eric Cardenas of Connecticut College, where O’Neil’s father, Bill, is director of major gifts. Juan Ramon Ortiz, a 26-year-old graduate student in engineering from Bayamon, Puerto Rico, according to his wife, Liselle Vega Cortes. Mary Karen Read, 19, of Annandale, Va. according to her aunt, Karen Kuppinger, of Rochester, N.Y.
More about the victims from Fox News.